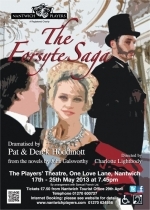 THE FORSYTE SAGA dramatised by Pat & Derek Hoddinott, from the novels by John Galsworthy. The Forsyte Saga is a sprawling tale spanning the years 1886 to 1920. It features scandalous affairs, divorces, financial wrangling, births and deaths, clashes between young and old, love scorned and love redeemed. In a loveless marriage, an affair tears the family apart and has far-reaching consequences.The drama centres on Soames and Irene Forsyte and the stifling, destructive power of the Forsyte dynasty. "The trouble with you, Soames, is you know nothing about women and even less about love."